When you're looking for a place to call your own in a tropical city that offers amenities, excellent living condition, and great schools, you should look into homes for sale in Port St. Lucie. Located along Florida's Treasure Coast, Port St. Lucie is nestled on the state's southeast side, between Vero Beach and West Palm Beach. Covering a total area of 76.7 square miles where 75.7 square miles is land and 1.2 sq miles is water, it has a current estimated population of 189,344 and is the ninth largest community in Florida. What was once a largely uninhabited tract of land with a fishing camp and several farms and business has now grown into a growing urban area, offering plenty of large residential lands for people like you who are seeking for a serene abode. If you haven’t entirely made up your mind about moving to Port St. Lucie, here are some reasons why you should do so. You’ll love its great climate. As a coastal city, Port St Lucie enjoys lovely subtropical weather where the summers are cooler and the winters are warmer. Living here means saying goodbye to heavy layers of winter clothes, shoveling snow from the front yard, and achy joints, and hello sandals all year long. This city’s fantastic climate is one of the reasons residents love this place. They get to enjoy their favorite activities like swimming and playing golf all year long. Port St. Lucie gets more sunny days compared to the rest of the country. There are plenty of nature sceneries to enjoy. There are no beaches in Port St Lucie, but you do get a totally different nature experience that’s unique to this city. Florida’s southeast coast was once home to miles and miles of freshwater marshes, and Port St. Lucie’s Savannas Preserve State Park gives you that experience. This city borders the North Fork of the St Lucie River, home to a host of birds and a definite must-see for bird watchers. Enjoy amazing sunset and nature views at Hillmoor Lake Park, or get a glimpse of history in Spruce Bluff Preserve. It supports the active, outdoorsy lifestyle. If you love the outdoors and enjoy various physical activities like hiking, running, swimming, etc. 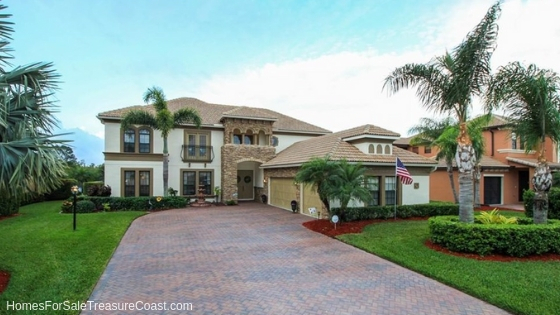 you’ll find Port St. Lucie an ideal city. This city has several environmental preserves and is close to beaches, so you can enjoy the activities you love anytime. You can go hiking in the greenways and trails of the natural preserves or go fishing in St Lucie River, a seven-mile-long estuary linked to the coastal rivers of St. Lucie and Martin Counties. This river is popular among anglers and is great for fishing tarpon, snook, jack, redfish, bluefish, and ladyfish. Or you can go swimming in any of the nearby beaches, or simply relax and enjoy the sunset. It offers the best of both worlds. This city is conveniently located so you’re only minutes away from the best beaches of the Atlantic Coast and have easy access to prime shopping and dining destinations, but far enough that you get to enjoy the peace and serenity of suburban living. It has highly-rated schools. Education is one of the top-most considerations when you’re moving to another location, and Port St. Lucie’s educational system does not disappoint. This city has excellent academic institutions, with Fau/SLCSD Palm Pointe Educational Research School ranking 9 out of 10. It is one of the safest cities to live in America. Two online ranking and review websites placed Port St Lucie on their lists of safest cities to live in the U.S. Niche put PSL on the eighth spot while Safehome blog placed the city at ninth. You won’t run out of things to do and enjoy in Port St. Lucie. This city has many amenities designed to educate and entertain. This city’s proximity to the beaches makes swimming and other water activities easy and fun. For retreat and relaxation, head to the Botanical Garden, a 20-acre luscious greenery that is home to various plants, birds, and animals. When you want to enjoy biking, hiking, horseback riding, canoeing, kayaking, or simply have a picnic in nature, the Savannas Preserve State Park is an amazing place to be. 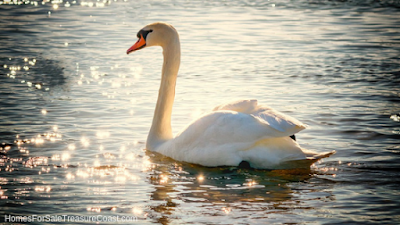 Hillmore Lake Park is another fantastic natural preserve where you can enjoy scenic lake views. For history lovers and nature lovers, Spruce Bluff Preserve offers 97 acres of land to explore. Are you a sports enthusiast? Watch the Major Leaguers New York Mets prepare for the season in First Date Field. Want to feel the strong community spirit? Head to the Civic Center, where you’ll find residents of all ages enjoying various activities with their friends. It is also the location of many festivals and events like Oktoberfest, the Festival of Lights, and New Year’s celebration and fireworks display. Port St Lucie is known for its top-notch golf courses like PGA Golf Club in PGA Village. Are you looking for a three-bedroom home? A condo? A home with a pool? How about a home with lake views? Port St Lucie is a young and vibrant city that offers different kinds of homes, neighborhoods, and views. Home prices in this city range from $150,000 to more than $3,000,000. Aside from the varying prices, you’ll also find a wide range of home-style and architectural styles. There are many neighborhoods in Port St. Lucie. Here are the three most popular ones. Tradition is an 8,300-acre master-planned, mixed-use community that opened in 2003. Located on the western section of the city, just off I-95, it merges the small-town charm with modern amenities buyers are looking for. There are also lakes, parks, and nature preserves, all designed to make living in this community easy and enjoyable. Tradition offers a variety of homes like single-family, townhomes, villas, and condos. Southbend is a neighborhood that features large single-family homes at reasonable prices. This community is located on the southern part of Port St Lucie, off Florida’s Turnpike. In this community, you’ll enjoy the look and feel of homes with HOA without spending anything at all. Many homes in Southbend were constructed between the late ‘80s to 2018. Residents enjoy graciously-spaced homes ranging from 1,196 to over 6,000 square foot, with 2-6 bedrooms and 2-5 bathrooms. Sandpiper Bay is located on the southeast side of Port St. Lucie, just off NW Federal Hwy. This community includes Club Med Sandpiper Bay, a popular family resort, and Ballantrae, a gated community with over 400 homes. 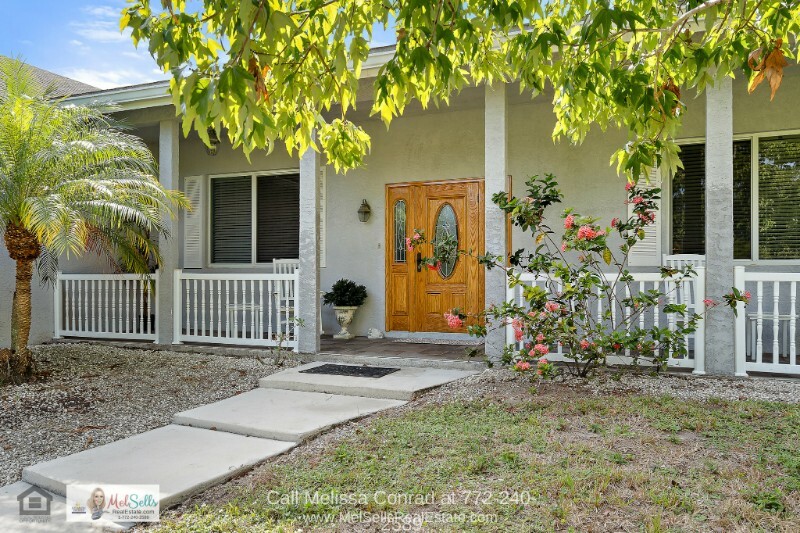 Whether you like to live in a gated community, in a spacious home where you can entertain, or in a cozy single-bedroom home where you can enjoy peace and quiet, you’ll find the home you need in Port St. Lucie. 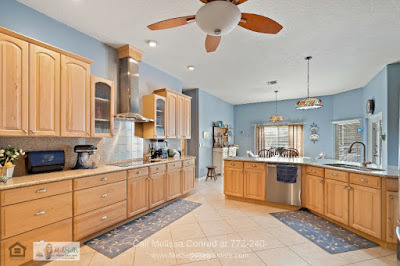 Are you in the market for a home in Port St. Lucie? Call me, Melissa Conrad, at 772-240-2589. As Port St. Lucie’s top Realtor®, I can help you find the home that fits your needs and budget. Give me a call today! Nestled in Florida's East Coast and bordered by Port St. Lucie on the north and west side, the St Lucie River on its east and the Jensen Beach to Jupiter Inlet Aquatic Preserve on the south side, Jensen Beach is the quintessential beach community. Its beautiful beaches offer the fun and excitement you're looking for. Its neighborhoods offer the privacy and serenity you want. And this community's proximity to big cities like Port St Lucie and West Palm Beach make it convenient and easy when you want to enjoy life's conveniences. 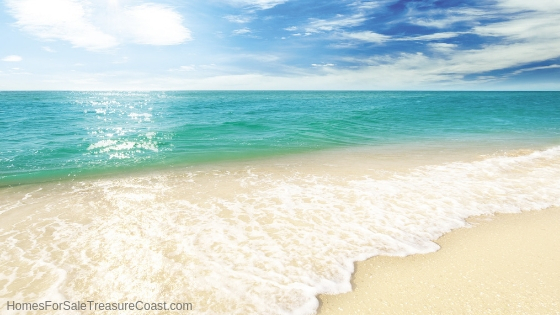 Aside from its fantastic location, there are many other things to love about Jensen Beach. One thing you can look forward to is its great weather. Jensen Beach has 239 days of sunshine, 34 days more than the average sunny days in the U.S.
Winters in this community are short, windy, and a little cooler, so you can say goodbye to achy joints and body pains during the cold season. You don't need to shovel snow either. You’ll also enjoy exploring its beaches. Altogether, this town has four beaches and all of them are found on the Atlantic Ocean side. The Jensen Sea Turtle Beach is the main beach and it's a popular site for youth surf camps in the summer. Bob Graham Beach is located 0.7 miles south of Jensen Beach and is a great spot for fishing and viewing the wildlife. For some peace and quiet, you can head to Bryn Mawr Beach, just about a mile south of Jensen Beach on Highway A1A. When you want to watch sea turtles, you can visit Beachwalk Pasley, located just north of Bryn Mawr. Another thing many residents of Jensen Beach is proud is their public education system. Jensen Beach schools belong to the Martin County School District which has some of the best schools in the state. We love our beachy little town with its friendly people, unique shops, live music, great food, art & seafood festivals, just overall good Florida fun. Are you looking for a two-bedroom waterfront condo? 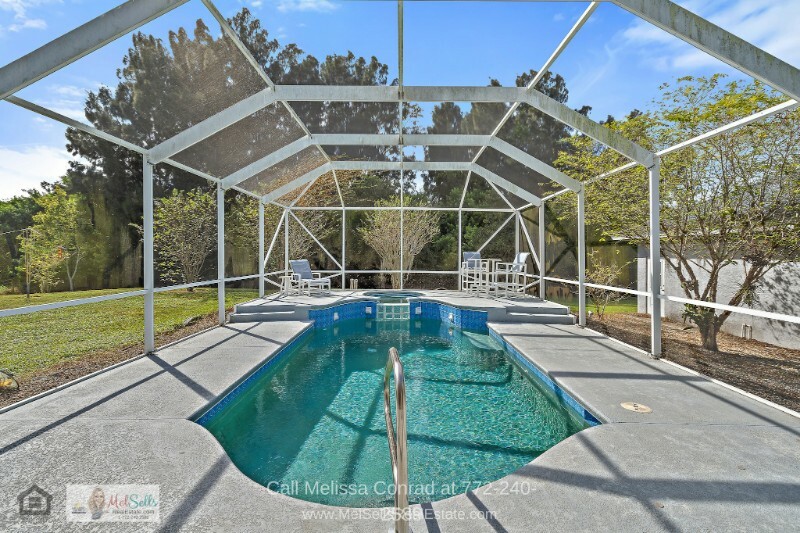 Or maybe you’re looking for a vacation home like a 4-bedroom home with a pool? Or perhaps you prefer a five-bedroom luxury home where you can entertain and relax? 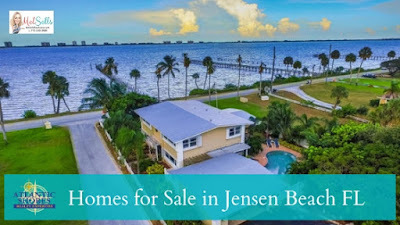 No matter what kind of home you look for, whether it is a single-family home, a condo, a townhouse, or a mobile home you'll find it in homes for sale in Jensen Beach. Do you have a specific architectural preference? 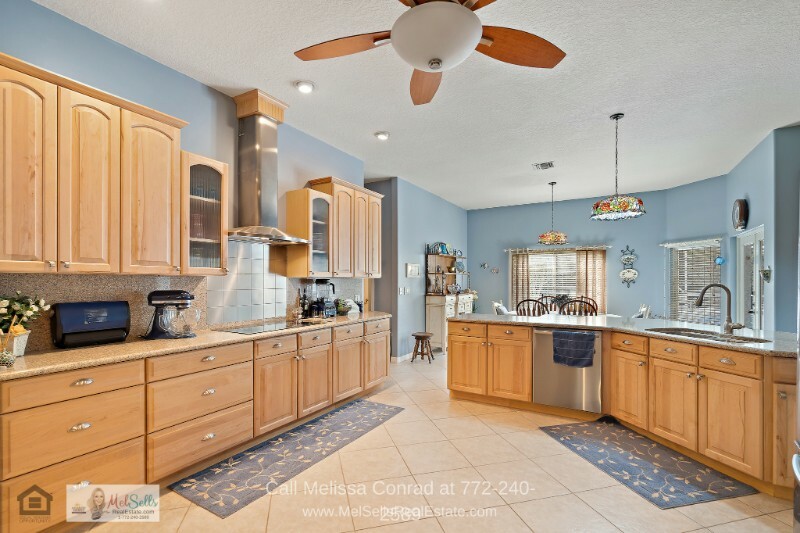 There is a wide variety of architectural styles available in homes in Jensen Beach. Ranch style homes are very common, but you’ll also find Mediterranean-style, Contemporary style, Victorian style, and custom-built homes. The average price of homes for sale is $240,000. You can find mobile homes and townhouses for as low as $107,900. Single detached home for sale start from $140,000 and goes up to millions of dollars. Condos, townhomes, and single-family homes in the price range of $200,000-$400,000 offer 1-3 bedrooms and bathrooms. Many of these homes are just a few minutes away from the waters and some even have waterfront views. 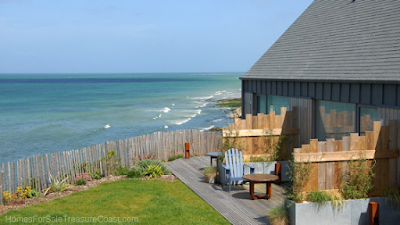 These homes are well-spaced and are great as a primary home or a vacation property. You’ll find that many properties starting from $4000,000 and up offer 3-4 bedrooms, 2-3 bathrooms, and generous-sized homes with an open floor plan, modern kitchens, and beautiful finishes. Many condos in this price range are located on Hutchinson Island and have amazing ocean views. 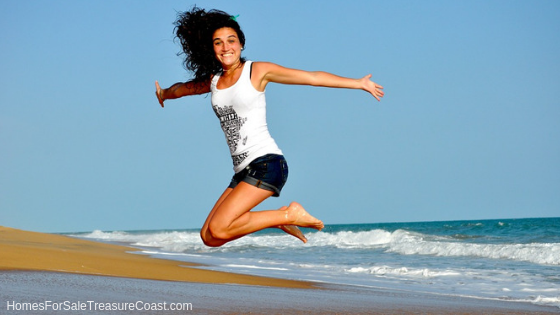 Homes in Jensen Beach provide you with the active lifestyle you seek. This community is a favorite among home seekers who want to reside in a conveniently-located beach community. Jensen Beach homes offer you a chance to live the lifestyle you deserve. If you’re ready to buy a home in Jensen Beach, call me, Melissa Conrad at 772-240-2589. I’ll help you find the home that fits your budget and lifestyle. In 2017, we on the Treasure Coast in Florida witnessed the wrath of Category 4 Hurricane Irma. St. Lucie, for one, endured a recorded 21.7 inches of rainfall, with top wind speeds of 100 mph. There’s a lot to love about Florida and its tropical climate is perfect for enjoying the beaches and coastal destinations year-round. But when we talk about rainy days, we know we can’t help but talk about hurricanes—it’s a part of life here. 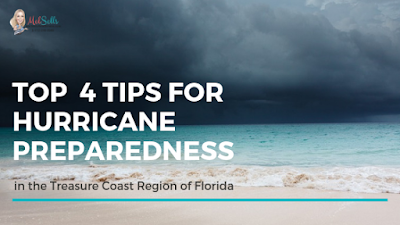 In this article, we will discuss 4 important things to remember about hurricanes and how to be prepared for them. First, you need to know your hurricane terms. Storm conditions vary in terms of size, intensity, and even angle from which the storm will approach a specific area. For starters, a tropical depression is a cyclone with winds of up to 38 mph. Tropical storms, on the other hand, have wind speeds between 39 and 73 mph while hurricanes have wind speeds of 74 mph and above. By familiarizing yourself with these terms, you will have an idea what’s about to hit your area in the coming days or hours. An emergency kit is something that you should keep close, in a spot that you can easily find. It must contain first aid supplies, medicines, a flashlight, a portable radio, extra batteries, and at least three days’ worth of non-perishable food and water. You should also pack towels, warm clothes, some cash, and a can opener if you’re packing canned food. It might help to have a basic mobile phone in there, too. Additionally, the emergency kit should be handy and portable enough for you to easily grab when it’s time to evacuate. You can already prepare and secure your home even before a hurricane watch or warning is issued. The National Hurricane Center suggests that you assess your home’s vulnerability to flooding, wind, and storm surge. This way, you can perform necessary precautionary measures. Protect your windows. Plywood boards are the least expensive solution and they can be put up even without drilling, as shown on this video. If you want a permanent reinforcement, you can install storm shutters, which give ample protection while adding style to your home at the same time. If you’re up for some window upgrades, you should consider getting high-impact window glass. They can resist the strongest of winds without compromising form and function. Secure the roof. If we’re expecting a really strong hurricane, you might want to have secure straps and clips in place. Strap down outdoor furniture and other items. If there are items that can’t be strapped down, just put them inside before a hurricane comes. Reinforce your doors, including garage doors. Regularly trim trees and shrubs. Get regular home inspections to make sure that weak spots are found and addressed immediately! When worse comes to worst, you might find yourself needing to evacuate. You might also end up separated from other family members for some reason. The anxiety that such scenarios could bring can be overwhelming, but you can lessen the worry by knowing that every family member knows your communication and evacuation plan. How will you contact each other if separated during a hurricane? It might help to have backup phones and numbers in case landline service is down. You might even find handheld radios useful at these times. How will you get back together? Set a rendezvous point that everyone knows and will possibly remain accessible during a hurricane. Where is the closest evacuation shelter? How will each of you get there? Pay attention to news broadcasts to get evacuation details. As your trusted Port St. Lucie REALTOR®, I'm not just here to help sell your home or assist you in buying a new home. I also want to help keep you and your property safe, too—all year round! If you want more tips on hurricane preparedness, get in touch with me today! Welcome to your slice of peaceful country living in the city! 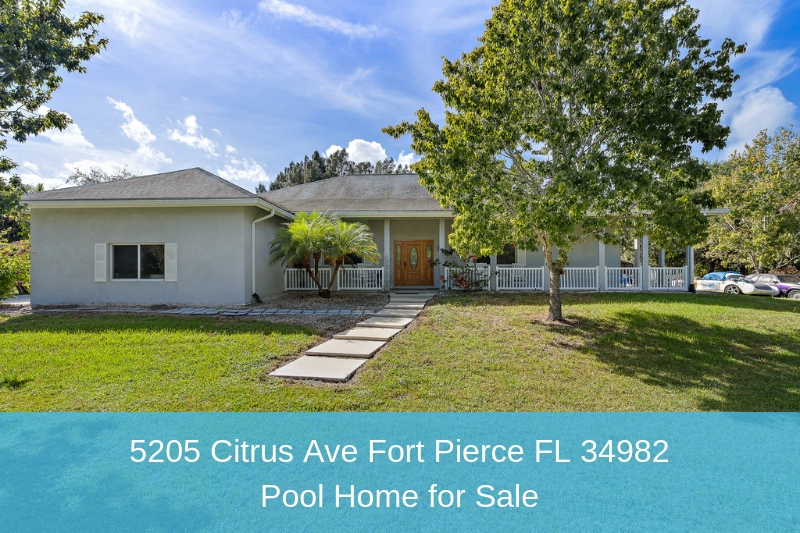 Comfort, space, and superior style is what you find in this fabulous Fort Pierce Florida home tucked away in a quiet and peaceful residential neighborhood close to our lovely Ft Pierce inlet and beach, shopping, highways and schools. Featuring 3 bedrooms + a Den, 2 bathrooms, 4 car garage, heated pool and all the finest finishes in its 3,317 square feet of gorgeous living space, you may never want to step out of this home. Nestled on a 2.19 acre lot, it delivers the private suburban lifestyle you’ve been longing for. You'll love the immaculate attention to detail given throughout the whole home, from its high-end kitchen to the spa-like bathrooms. It is also an energy efficient home. It boasts of PGT impact glass windows and its exterior walls and trussed are reinforced with extra rebar. Its average electric bill during summer months is $240 and $80 in winter. On top of all that, this home for sale in Fort Pierce delivers elegant living both indoors and outdoors. This home ensures that light and space are showcased in every room. The interior is beautiful, bright and airy, thanks to 10-11 foot ceilings with decorative tray insert, rounded corner-beads walls, and tall base-molding. 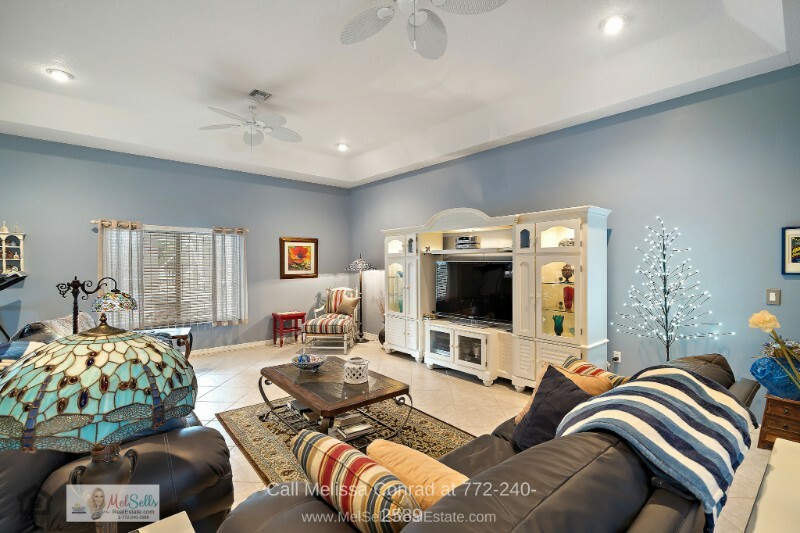 The family room features porcelain tile floors, view of the pool, tray ceiling with recessed lighting. The den has double glass french doors and if you need more bedrooms, this space can easily be converted into the 4th bedroom. The kitchen is designed to make any chef happy! With gorgeous Quartz counters, lots of custom real maple cabinets with decorative handles, newer stainless steel appliances, double wall convection oven, cook-top stove with hood, and a walk-in pantry with custom door and shelves, this kitchen is ready for you! The owners suite is ready for rest and pampering. Boasting fabulous floor space, tall tray ceiling and a walk in closet that is 18 feet deep! The en-suite bathroom is like visiting a spa, relax in your Air-Jet Jacuzzi tub or take a quick shower in the beautiful sport shower equipped with body jets and porcelain tile to the ceiling! Dual gentleman height vanities with lots of storage ensure there is enough room for both owners. This suite is ideal for your private retreat. And if you want a safe room, this owner's suite is equipped with a solid door, deadbolt and reinforced walls. If you need more space, the laundry room which includes front load washer and dryer, is large enough to add a bathroom or to make an office. 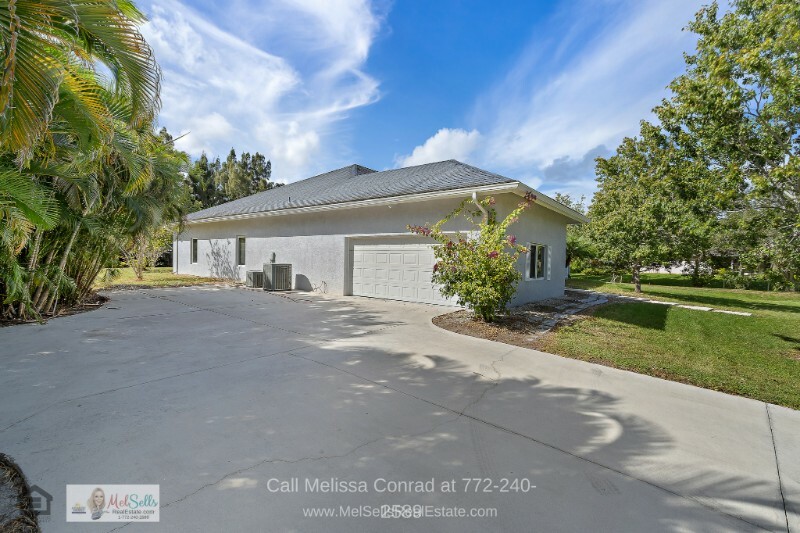 An extraordinary home wouldn’t be complete without a fantastic outdoor retreat, and this Fort Pierce home for sale delivers! 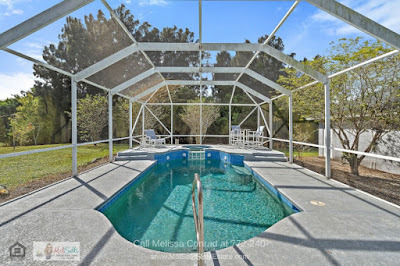 It features a screened pool with heater so you can enjoy a relaxing dip any season or any time of day. A pool is always a hit for any age, so invite your friends and relax and enjoy this private outdoor retreat. This Fort Pierce real estate property has everything you want and more! Its 2.19 acres are fenced and with no association and county only taxes. It is on city water, private septic, and well sprinklers from the pond. Its detached 2-car garage has water and electric and can be converted into a guest house if you need a guest home. It is also conveniently located. It is only two minutes away from the Nelson’s Family Farms. US Highway 1 is about five minutes away. White City Elementary School and White City Park are only a minute away. There are plenty of shopping and dining options with this home’s 2 -mile radius. Every amenity you want is within reach in this exceptional home. Clearly, a lot of careful planning went into this home. From its high ceilings, large entryways, impact glass windows, energy efficient appliances and awesome built-ins, this home is everything you’ve dreamed of and more! Make it yours for ONLY $474,900. For similar properties in nearby areas, call Melissa at 772-240-2589 or visit http://www.MelSellsRealEstate.com/ where you can search for homes or email Melissa. Don’t miss this opportunity to own the home of your dreams! 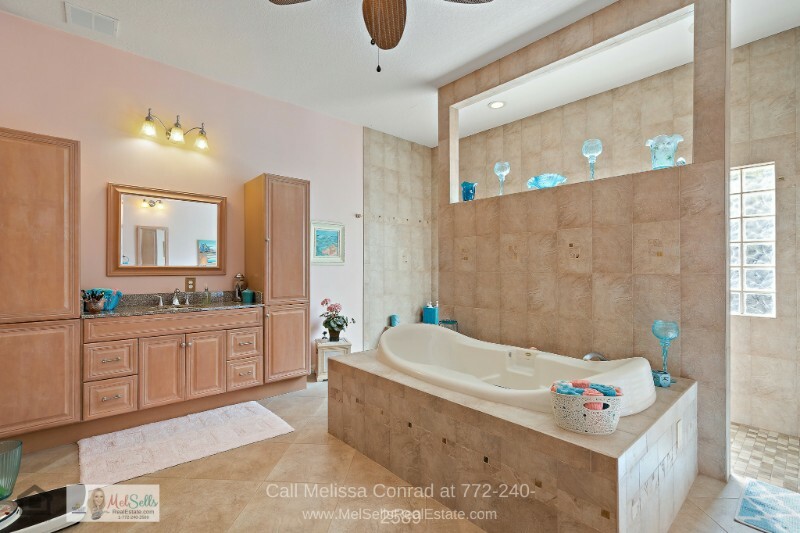 Call me, Melissa Conrad, at 772-240-2589 to schedule your private showing today.